Hydrogeo are highly experienced in scoping, organising and undertaking intrusive ground investigations on an extensive range of sites. We work with our clients and the statutory consultees to ensure that the site investigation is designed to fulfil the project objectives. Intrusive Site Investigations are principally progressed following completion of a Phase 2 Desk Study & Site Walkover. The site investigation is designed to confirm geological and hydrogeological conditions, target areas of concern based on current / historical land use and identify the presence and significance of contamination associated with the site and frequently the adjoining area. Site Investigations are carried out in accordance with CLR11 and relevant British Standards. For contaminated land sites, the data collected during an intrusive site investigation is utilised to update the site conceptual model, progress quantitative risk assessments and where required inform a site remediation strategy. We utilise a range of intrusive and non-intrusive techniques to undertake ground investigations. 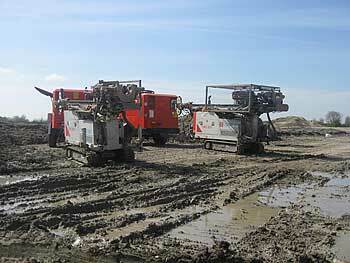 These include traditional techniques such as trial pitting, window sampling, cable percussive and rotary borehole advancement in order to retrieve soil / rock samples for logging, subsequent soil chemical analysis. Staff undertaking ground investigations are graduate engineers with appropriate qualifications, experienced in geological disciplines, and hold current CSCS cards. If you would like to speak to someone at Hydrogeo about Phase II Site Investigations please call 07584 623267 or email [email protected].